We're happy to announce that KerberosSDR is now available for pre-order on Indiegogo. As promised we announced the release to KerberosSDR mailing list subscribers first, so that they'd be the first to get the initial discounted early bird units. However due to much higher than expected interest, we have released a few "second early bird" units at a still discounted price of $115 + shipping. We're only going to release 300 of these so get in quick before the price jumps up to $125. Our pre-order campaign will last 30 days, and afterwards the retail price will become $150. 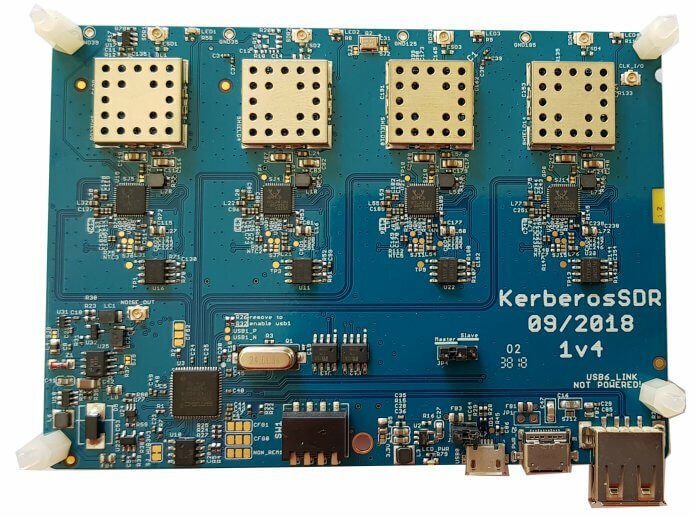 If you weren't already aware, over the past few months we've been working with the engineering team at Othernet.is to create a 4x Coherent RTL-SDR that we're calling KerberosSDR. A coherent RTL-SDR allows you to perform interesting experiments such as RF direction finding, passive radar and beam forming. In conjunction with developer Tamas Peto, we have also had developed open source demo software for the board, which allows you to test direction finding and passive radar. The open source software also provides a good DSP base for extension. More information available on our KerberosSDR page, and the Indiegogo page. I am thinking of using the KerberosSDR as a receiver for an L-band microwave radiometer. Applications would for example be the measurement of soil moisture at 1400-1427 MHz. 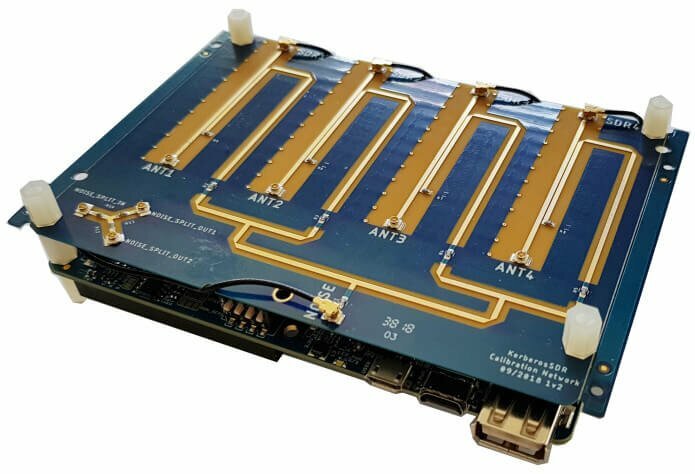 Therefore, I’d like to know if it would be feasible to connect one or two LNA’s plus band pass filter after the calibration board? Does KerberosSDR support HF Direct Sampling Mode as the V3 does? Sorry no it will not. The indiegogo page says that a Linux computer is required; surely that’s just due to the software you have created so far? Any reason why supporting Windows software can’t be made (by anyone) ? There is no reason why Microsoft Windows or OSX or FreeBSD or GNU Hurd or HaikuOS or Solaris or HP-UX or AIX …. or insert any other random Operating System could not (eventually) be supported. My guess would be that the developers are using the operating system which they are most familiar, and also that they can easily stand on the shoulders of many other developers to leverage existing tools and libraries to reduce their workload. And focusing on one operating system would help them to maximise results, which would mean more advanced tools a lot faster. Considering how few open source phase coherent SDR tools currently exist, I’d see that as a very good thing. I’m sure once the actual hardware is in the hands of many more software developers with strong DSP knowledge then you will see new tools for other operating systems. But the hardware is already supported by all non phase coherent applications under windows. The real problem is that when it comes to public phase coherent applications, it is a mostly empty space right now. It’s still an RTL-SDR, so you can use any RTL-SDR software with it, be it on Windows or Linux. But the phase coherent software we have developed for it is based in Linux. If someone wanted to, they could port it to Windows. These guys (rtl-sdr.com and othernet.is) have a pretty good track record of delivering quality hardware. Relative to the average indiegogo campaign, I am fairly confident that these guys will deliver something that more-or-less works. I have used Indegogo before and wasn’t disappointed. I am very interested with this project and have an Odroid UX-4 I can use for a mobile DF platform. The local repeater club has Fox-Hunts and this would be a great use for this product. I can see an advanced application of several (4 or more) distributed around a wide area listening for an interfering signal to DF. Thanks for the vote of confidence. Regarding the comment about the imepedance, the PCB substrate of the calibration board is only 0.6mm thick, so the commenter probably didn’t realize as that changes the required shape slightly. what about spurri and usb generated noise ? will there be a web interface for controlling the linux Software ? There are unfortunately compromises that need to be made when combining 4 dongles onto the same PCB coherently, so it’s not as clean as the V3 which is the cleanest RTL-SDR out there. USB noise is filtered via a choke. Spectrum cleanliness is more than good enough though. No web interface in the current version, however, it is not difficult to VNC into the SBC/computer being used with the board and control it that way. Hmm I dunno, looks mighty suspicious. Can you please describe what you mean by this? We are after our third prototype, tons of engineering hours both on SW and HW side. ya sorry poor choice of verbiage, I was thinking about the traces/routing layers and the capacitance random/spurious and why you didn’t cloverleaf the four – but it looks like you conquered that already! If you click on the youtube channel of RTL-SDR blog in that video, you will find other 6 videos about KerberosSDR testing too. The hub can support all 4 units running at the same time at 2.4 MSPS. Yes it should be possible to combine the bandwidths coherently although we haven’t tested this yet. You say all 4 units running at the same time at 2.4 MSPS. Why not the rated 3.2MSPS that the RTL-SDR can run at. If you do not need all the samples, and do not care about aliases, then you can run any RTL-SDR 3.2 MSPS. But for phase coherence you need all the samples and most consider 2.4 MSPS as the upper limit to have no samples dropped. Even a single RTL-SDR cannot run at 3.2 MSPS without dropping samples internally. On good machines 2.56 MSPS is the maximum without dropping samples, and Kerberos can handle running all four at 2.56 MSPS. But we say 2.4 MSPS to be safe since some PCs have trouble at 2.56 MSPS even with one RTL-SDR.